After a season filled with distractions and disappointments, the No. 24 Pitt wrestling team closed out its regular season on a three-match winning streak after defeating Duke Saturday night. The team endured a midseason coaching change, a wrestler falling out of his dorm room window and breaking several bones and a scandal involving women found on the internet in a wrestler’s hotel room during a tournament in December. But on Saturday night, Pitt (11-5 overall, 2-3 ACC) cruised to a 28-9 victory over Duke (4-9 overall, 0-5 ACC). With two Panthers pinning their opponents and 285-pounder Ryan Solomon scoring an upset victory over Jacob Kasper — the No. 3 heavyweight in the country — the team ended its last regular season meet of the season with a victory at the Fitzgerald Field House. The Panthers’ victory capped off a successful season, for three wrestlers in particular. Sophomore TeShan Campbell and juniors Dom Forys and Ryan Solomon all finished the year ranked in the nation’s top 25, according to InterMat. All three won their bouts Saturday. Seniors Mikey Racciato and John Rizzo were honored before their last home match with framed Pitt singlets, given by co-head coaches Drew Headlee and Kocher alongside acting Athletic Director Randy Juhl. Both wrestlers walked out of the gym as winners, Racciato with an 11-8 decision and Rizzo with a 5-0 shutout. The 149-pound Racciato kicked off the match, taking on fellow senior Xaviel Ramos for the Blue Devils. Starting the final period in the bottom position with the score tied at five apiece, Racciato escaped, took down Ramos and exposed him to his back for two more nearfall points, making the score 10-5. A reversal and stalling warning gave Ramos three more points, but Racciato escaped and the match ended with an 11-8 decision to give Pitt an initial 3-0 lead. First-year Taleb Rahmani followed Racciato for the Panthers, but he ran into trouble in the first period when redshirt junior Jake Faust grabbed his ankle in a single-leg shot. But Rahmani avoided the takedown before sensing his opportunity and quickly getting Faust on his back. Moments later, the referee slammed the mat, signifying a pin for Rahmani and six more points for Pitt. Refusing to be outdone, Campbell got redshirt senior Michael Wright on his back a minute and a half into his bout. Using a crossface cradle, the No. 16-ranked Campbell recorded the Panthers’ second pin in a row just 1:41 into the match. After Campbell’s quick outing, 174-pound sophomore Donovan McAfee — who gained weight to move up a weight class — wrestled Duke senior Connor Bass. Bass owned a 3-0 lead going into the third period but with a minute left in the match, McAfee escaped after starting the period on bottom. McAfee was unable to score and fell to Bass 4-1, giving Duke its first win of the match. 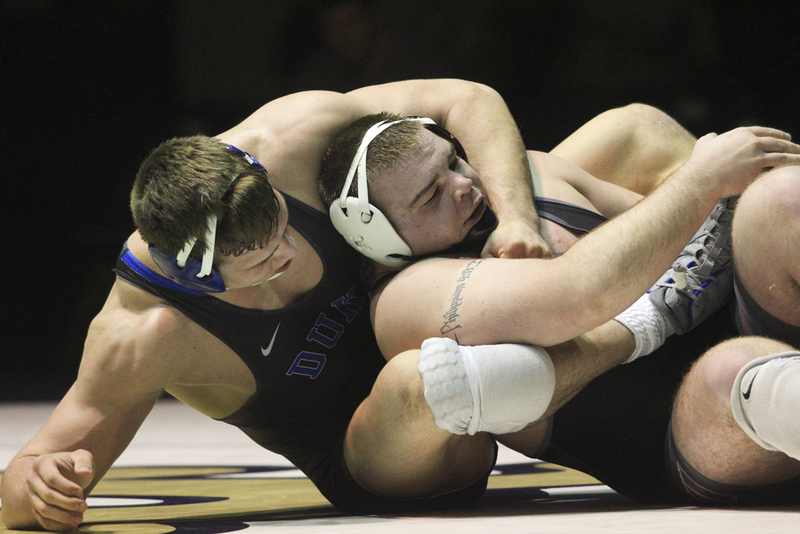 In the 184-pound bout, redshirt sophomore Zach Bruce wrestled Blue Devils junior Alec Schenk. Bruce led 1-0 going into the third period, but a technical violation from Bruce gave Schenk a point to even the score and take the bout into sudden-death overtime. Schenk promptly took down Bruce, giving him the 3-1 decision. Next came 197-pound senior Rizzo’s final match in the Fitzgerald Field House. He competed against junior Luke Farinaro. In the third period, Farinaro attempted a shot, but Rizzo defended well and got Farinaro on the ground instead. After a stalling call and assessing the riding time, Rizzo won his last home bout by a score of 5-0. Redshirt junior heavyweight Ryan Solomon stepped onto the mat next to square off against Duke’s highest-ranked wrestler, No. 3 Jacob Kasper. The No. 18-ranked Solomon took Kasper down with a single-leg takedown in the final minute of the first to take an early lead. After an escape, Solomon started the second on top with a 2-1 lead, then Kasper escaped again 35 seconds into the second period. Starting on bottom in the third, Solomon was able to gain two points on a reversal, and when time expired, Solomon completed the upset victory with a 4-3 decision. After Solomon, 125-pound LJ Bentley wrestled against junior Thayer Atkins. Bentley escaped from bottom position after a 0-0 first for a one-point lead. It seemed Atkins score two points after he nabbed Bentley’s ankle. But for the second time that night, a Pitt wrestler fought his way out of a desperate position — after Atkins pulled on Bentley’s headgear, the referee awarded Bentley a point. Atkins escaped with 15 seconds left in the third, but Bentley held on for a 2-1 win. Next, it was No. 8-ranked junior Dom Forys’ turn to take the mat against 133-pound Cole Baumgartner. Forys cruised to a 14-3 major decision, with the Duke wrestler’s only points coming from uncontested escapes. Saturday’s final match was between the 141-pounders, with Pitt redshirt junior Nick Zanetta facing off against Duke redshirt sophomore Zach Finesilver. Zanetta only scored thanks to an escape and Finesilver gained a convincing 6-1 victory. Ultimately, the win mattered little, and the meet ended with a 28-9 final score in favor of the Panthers. The team is now looking forward to ACC Championships, which will take place March 4, in Raleigh, North Carolina.